I used these stork-motif, melt and pour soaps as favors for my daughter’s baby shower. They were a huge hit and people loved the fragrance. As well, they were taking home something useful, instead of the usual knick knack. Prepare the melt and pour soap according to the directions on the package. The specific directions will vary according to the type of soap, but melting is usually done in a double boiler or microwave oven. Do not boil or overheat the soap. When the soap base is melted, add color and scent. I used baby powder fragrance. The amount added will depend on your preference, and how much soap you are making (usually about 1 teaspoon of fragrance per pound of soap, but check with your soap manufacturer instructions, as yours may vary slightly). It is always best to start with a smaller amount of fragrance then add a little more if needed; too much fragrance may cause your soap not to set right. When adding the soap color use a little at a time and don’t add so much that the bubbles become colored as well; they should remain white or clear. When choosing the molds, check the product description which should tell you how much soap is needed to fill each mold. Multiply the number of ounces specified for each mold, by the number of soaps you wish to make; this is the approximate amount of melt and pour soap that you need to buy, but it’s always nice to have a little extra in case of mishaps. My soap mold held four ounces of soap. Hi there, thank you for sharing this information. 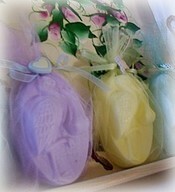 I would like to make the stork soaps for my daughters baby shower however I am unable to find the molds. Do you have any idea where I could purchase them please? I’ve updated the stork Amazon links in the project above to show you similar molds available from Amazon. One is for chocolate, but also works for soap. You could buy the exact mold used at one time, but it looks like it is no longer available. These alternatives should work well though!